Miss Julia - Tina Mitchell uniquely embodies the female protagonist’s ambiguous personality using a combination of playful, ironic and melodramatic registers. provide the audience a profoundly sad, desperately struggling woman. and self-punishment; across the stage. New York Times: Mata Hari, A Different kind of Queen of the Night. New York Classical Review: Prototype Opens with absorbing, finely crafted Mata Hari. 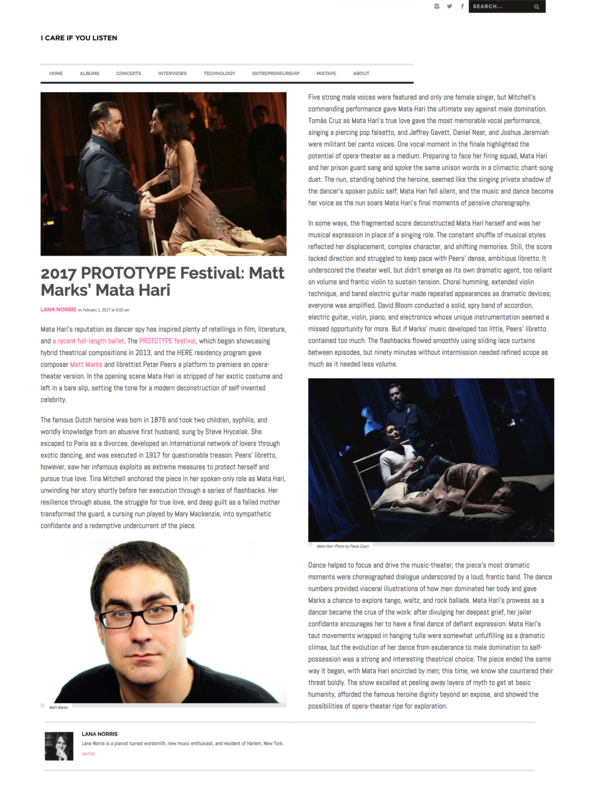 Wall Street Journal: Mata Hari at The Prototype Festival, the Showcase for Innovative Opera. I Care if You Listen: Matt Marks' Mata Hari. Stagebuddy: Mata Hari, 2017 Prototype Festival.